Week three of the (not so) little guys is here, and one service academy hands off the top spot to another. It’s almost unfair that Air Force has to move down. They fought admirably against superior competition last week, but if the statement “a win is a win” is to be true, then its corollary, “a loss is a loss”, must also be true. Also, if you are looking for a theme for the teams I’ll be discussing this week, it is teams that I thought would be good, but ultimately not conference contenders. So far, I’ve been wrong about all three of these teams. They look like contenders after all. Toledo should probably be higher on this list with both of their wins coming over Power Five teams, but they were both close games and Iowa State is a marginal “Power” team. Part of what is hurting them is the fact that they, like LSU, have played one fewer game than almost everyone else because of a cancellation in week one. Another thing that hurts them is a pretty unassuming stat line. Obviously stats aren’t everything, but their quarterback, former Alabama backup Phillip Ely, has completed less than half of his passes. 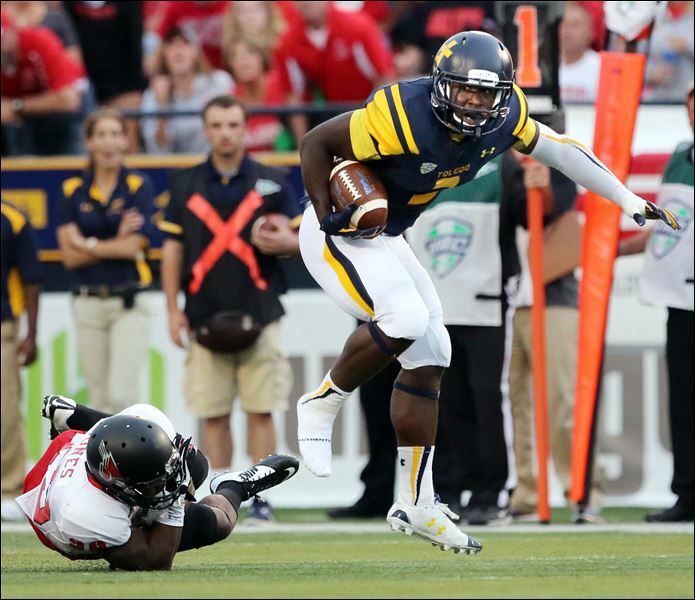 That can’t continue if Toledo is going to continue winning. Kareem Hunt and Damion Jones-Moore are undoubtedly the offensive catalysts for this team, both of whom are averaging over 5 yards per carry and have a combined 224 rushing yards. Those of you who haven’t been paying attention may not have noticed that Charlotte won its first two games as an FBS program and was looking like it could be a surprise team in the C-USA. That notion got annihilated by the Blue Raiders on Saturday. Coming off of a loss that was closer than the score indicated to Alabama, Middle Tennessee bounced back in a big way. Quarterback Brent Stockstill is looking like one of the top signal-callers in the conference in the early going with a nearly 70% completion percentage and nine touchdowns, five of which came last week. 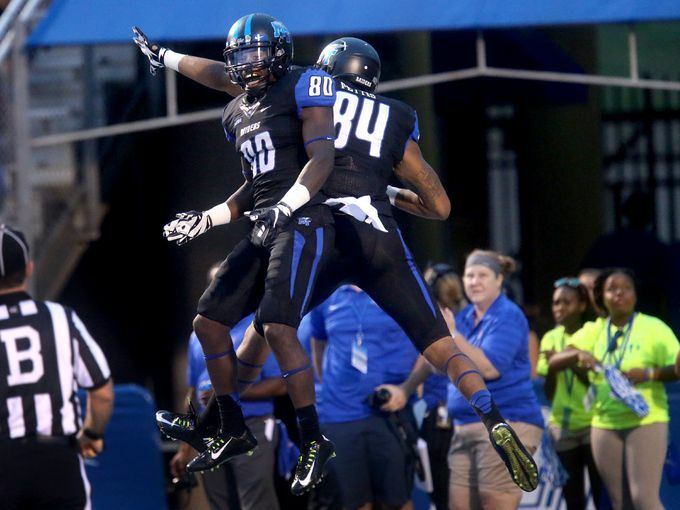 The Blue Raiders have also put up 70+ points in both games that weren’t against Alabama. Middle Tennessee has a major opportunity to play spoiler against two “Power Five” teams in the next two weeks with games against Illinois/West Canaan and Vanderbilt. I predict that at least one of these is a win for Middle Tennessee. After an opener against Colgate and a week two bye, it has taken us a little while to see just what Navy might have this season. Ross and I both believe that they will be a ten-win team. They have made that prediction look pretty solid to date, although obviously it’s still premature to be discussing any season-long predictions, on Saturday. 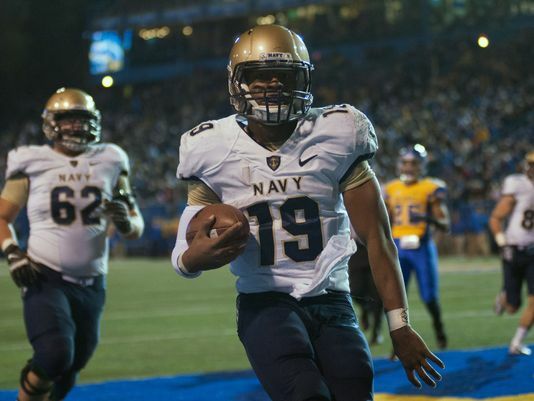 Keenan Reynolds was the best option quarterback in college football on Saturday with 142 rushing yards and five touchdowns. As a team, the Midshipmen racked up over 400 yards on the ground (and only 41 threw the air) and look like they are a legitimate AAC contender in their first year as a member of the conference.